"Su Nero Nero - Over Black Black"
"Athena was black if you look back". Almamegretta. painting, sculpture, photography, video and design, national and international artists, historical and contemporary figures. A composition of artistic productions, points of view and critical looks. A story and a way of telling it. Over black, black; fullness over fullness. 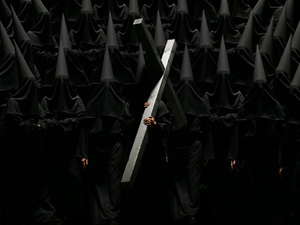 Black as a material, a philosophy, a profession of faith. Black as a trait of a generation, black as the distinctive mark of a social condition. Black and a piece of history. Our history. Black as the hole at Ground Zero, black and a dire decennial. reconnaissance, a distillate - drop after drop - of a story that was lived, passed through and digested. Without haste. A story and the way of telling it. Through the eyes of Franz Paludetto.